Currently on view at Luhring Augustine in New York, Untitled (Painting) brings together the work of Tauba Auerbach, Wade Guyton, Albert Oehlen, Bernard Frize, Daan van Golden, Charline von Heyl, Josh Smith, Christopher Wool, and Heimo Zobernig. This show is an opportunity to view together a group of artists who have helped shape modern painting practices, and is a testament to the fact that the medium is alive and well. Though the artists in this show are incredibly distinct, the works are connected through a common interest in process and modes of abstraction. Tauba Auerbach has throughout her career been interested in altering perceptions. She aims to re-imagine the possibilities of visual communication by challenging expectations associated with the language of art. For her Fold paintings, one of which is featured in this show, Auerbach defies the limitations of painting by creating works that are at once two and three dimensional. For these works, she first folds the canvas and then paints it, shading and layering in order to create an illusion of density. These beautifully textured pieces put to bed the threat of flatness sometimes associated with painting and in doing so encourage further reinvention of the medium. 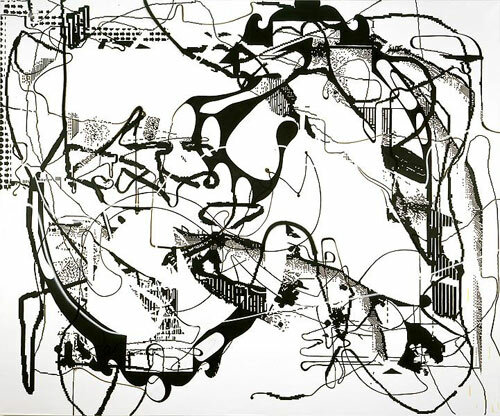 Albert Oehlen’s large, black and white piece is another celebration of painting’s potential. The computer series, which Oehlen started making in the 1990s, makes use of both digital imagery and established painting components, bringing together unconventional and traditional methods for art making. The eye follows a dizzying maze of choppy, pixel-happy lines and curves, only to be paused by a stroke of paint or a collaged element. These unexpected breaks refresh the work and usher the viewer into a reading of the process. With reference to his work, Oehlen has said “no magic, no science, no excuses,” and keeps this promise by creating speculative paintings that repurpose art as an exploratory device rather than one of resolved beauty. A hulking painting by Charline von Heyl sits central in the smaller second room of the gallery. Doublebeast, a combination of acrylic, oil, and charcoal, swells and bulges with a scaly mass that floats above a textured spill of sharp yellow paint. The work is a powerhouse, wrestling with the elements of painting and demanding that the viewer negotiate spatial discrepancies and trust the coherence. Ultimately, the dubious quality of the forms is balanced by the honesty of her process, and this is why we willingly follow von Heyl into such a complicated world. In the same room with von Heyn is one of Bernard Frize’s colorful paintings. Frize’s purposeful experiments with the medium produce rich, vibrant works that achieve aesthetic significance without making it their primary function. The fuzzy labyrinthine piece in this show begs the question “how was it made?” Answer: using an airbrush and employing his developed technique of merging and bleeding different colored lines. Frize’s work is labor heavy, and he often hires individuals to work on the paintings with him. The mechanical and methodical means by which the paintings are created result in revelatory moments when visual appeal is abandoned and the arduous process comes into focus. Though Frize favors a painting’s evolution over its expression, he nevertheless creates works that are charged, powerful, and lingering. Another piece by Frize in this show, a large texture-heavy chain-link painting, further emphasizes this phenomenon. The other works in the gallery – a stunning and chaotic Christopher Wool, an elegant Daan van Golden, two loudly abstract and quietly geometric works by Heimo Zobernig, one of Wade Guyton’s printer paintings, and a slick Josh Smith – shouldn’t be dismissed here. The premier of Larry Clark’s Tulsa – which is playing in the gallery’s third room – is long, porny, and pretty much what you’d expect from the groundbreaking photo series. It ends up feeling like an excuse to sit down before heading back out to the main spaces for another tour.